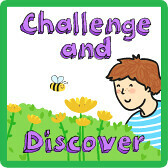 We’ve made a few changes to Challenge and Discover this month. The challenges will now be once very two months and we’re going to let you know in advance what they will be. For our first challenge of 2014 Inspiration Laboratories and I have chosen Fun with Rulers. What I really wanted to do was go out and find some sticks to measure and was hoping to find one we could use as a metre stick, but it literally hasn’t stopped raining for the last week, so I’m going to share some of our previous activities using rulers instead. You could use a ruler to test your reaction time. Keep lots of different rulers in a Numeracy at Home box. Can you measure your height and make a metre ruler with DUPLO or LEGO? What about going outside and measuring plants, trees and bugs? You could measure rainfall with a rain gauge. You could even draw around yourself and measure your arms and legs. Or, how about using a teddy or doll and measuring their arms and legs? Finally, how about using a ruler to compare the viscosity of different liquids? I know rulers don’t seem very exciting, but there really are so many fun things to measure and compare. If you collect lots of data try to think how best you can organise it, can you put it into a table and draw a graph? Link up here or at Inspiration Laboratories, where there are lots more great ideas for Fun with Rulers.